Farah Al Qasimi was raised in both the United Arab Emirates and the United States. She holds a bachelor’s degree in fine art from Yale University with a concentration in analog and digital photography. Al Qasimi participated in Campus Art Dubai in 2013 and held a summer residency at Burren College of Art in Ireland in 2011. She also won the Salama bint Hamdan Emerging Artists Fellowship, which is administered through a partnership with the Rhode Island School of Design. She has exhibited her work at numerous venues in Dubai, including the Cuadro Fine Art Gallery, SIKKA Art Fair, and The Pavilion. Al Qasimi currently teaches photography at the Higher Colleges of Technology in Dubai. She lives and works in Dubai. Often finding inspiration in music and film, Farah Al Qasimi regards her photographs as stills from a movie. Working primarily in large-format photography, she searches for oddities in everyday life, which often involves entering the homes of friends and creating images that reflect the owners’ personalities. With her art she retraces the intimate journey of her Emirati roots, along with her departure from adolescence. Al Qasimi created a series of photographs that features her family’s ancestral homeland, Ras Al Khaimah, the emirate located in the northern part of the country. 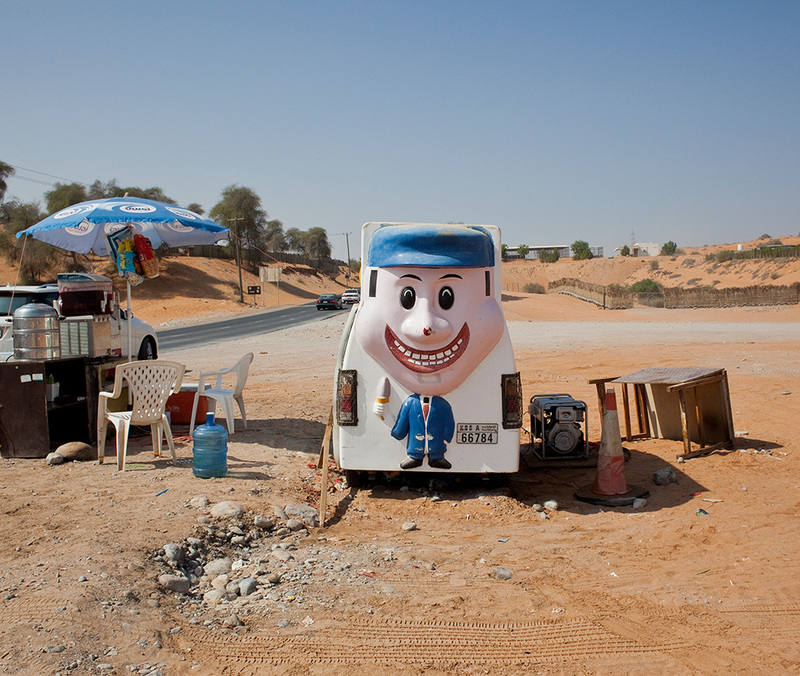 In Ice Cream Truck, she identifies the uncanny in a mundane moment with the whimsical vehicle parked at a makeshift roadside stop. The scene reminds the artist of the tangible remnants of childhood dreams, playful summer days, and endless possibilities of youth.